Claims: Real Control Intense Renewal super moisturizing mask helps provide moisture, control and repair to dense, dry, sensitized hair. 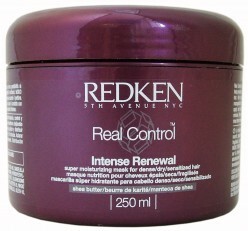 Formulated with Redken’s exclusive Interbond Conditioning System and Care Adjust Complex, it delivers discipline, smoothing control and internal strength. Hair texture is transformed with increased manageability and shine. Directions: After shampooing, apply and comb through hair. Leave on hair 5 to 15 minutes. Rinse thoroughly. What I think: I like that this mask is thick but not too thick that it’s difficult to distribute evenly. It has a very light scent which I also like; I can’t stand deep conditioners that smell more like perfume than anything else. This conditioner absorbs well into my hair and leaves it feeling very moisturised once I rinse it out but for some reason that feeling last longer on my relaxed hair than on my new growth. One day after using this, my new growth will need moisture but my ends will be fine. This conditioner works best for me within the first 6 weeks of getting a relaxer and works even better when I mix it with coconut oil or olive oil. My daughter’s hair is natural and this also works best for her when it is mixed with olive oil. Would I purchase again? Maybe, it won’t be my first choice, mainly because of the price. I get 3 uses MAX out of this conditioner. Oh, that's really pricey! $200TT but it does sound interesting though. Thanks for the review! It is pricey. I have a very heavy hand when it comes to conditioner, the 3 uses I get is because I'm skimping lol.